Health Literacy Partners is a health literacy consulting business created by Dr. Terri Parnell. Health literacy is about improving communication and health outcomes by enhancing both the skills of persons receiving care or treatment and the professionals or systems that are providing the care and treatment. Our brand research began by getting a thorough understanding of this complex field from Dr. Parnell and looking at competitors in the marketplace. We then worked together to develop a name for the new business. While we considered many options, a straightforward name that included the key words Health Literacy was chosen. The tagline “Communicate. Collaborate. Educate.” along with adding the word Partners to the business name reinforced Dr. Parnell’s focus on working collaboratively with clients, patients and medical staff. Visible Logic designed the logo for Health Literacy Partners that was an abstracted tapestry to show the overlapping areas of focus involved with Health Literacy. Then, we created matching branded business cards and letterhead. Finally, a custom-designed WordPress-based website was developed that had the same bright and inviting look. 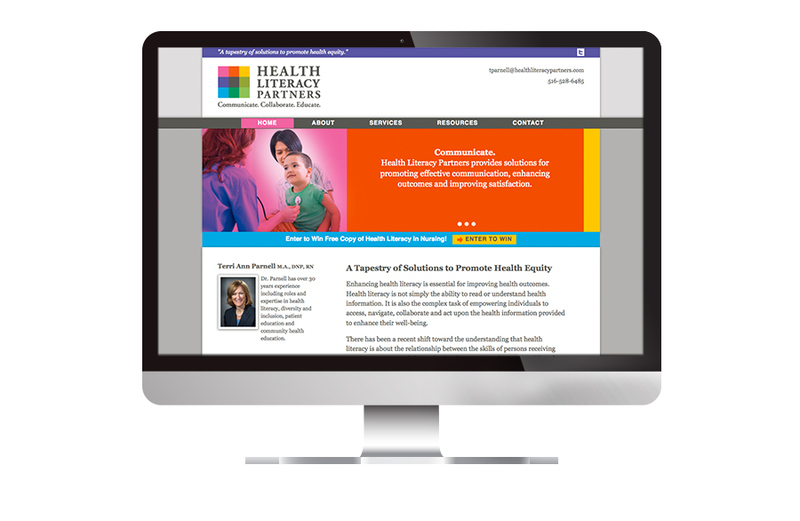 Health Literacy partners web site design. See the site live.